A trampoline is a great way to get your children to be more active and to spend more time outside. The downside of owning a trampoline is that there are a few things you need to do in order to prevent damages. Trampoline maintenance is fairly simple. You need to take necessary precautions because weather can cause serious damages to your trampoline mat and high winds could create a very dangerous situation if you do not secure your trampoline frame. Maintenance will extend the lifespan of your trampoline and reduce risks associated with a worn-out mat, rusted springs or a frame that sustained sun damage. This is an essential guide to read for anyone shopping for a backyard trampoline. A lot of trampoline maintenance needs stem from weather conditions. The best way to care for your trampoline depends on the area where you live and on the kind of weather you will have to deal with. Never underestimate the strength of the wind or assume that your trampoline is heavy enough to stay on the ground. Trampolines often get blown away in storms, which can result in serious injuries or property damages. Keep an eye out for hurricane and severe storm warnings. Even high winds can be dangerous if you have a small trampoline with a light frame. Use sand bags, trampoline anchors, or other products to secure the frame. Remove the net or safety enclosure so objects blown around by the wind won’t get caught in it. If possible, take the trampoline down and store it if there is a hurricane warning. UV rays can damage the trampoline mat and greatly reduce its lifespan. 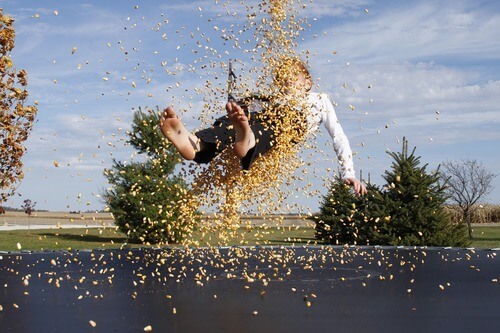 Sun damage can make a trampoline mat so brittle that your child could end up jumping right through it. Sun damage can also affect the padding that covers the spring and the plastic covering the frame of the trampoline. You can find trampoline made with UV-resistant materials or invest in a good trampoline cover to protect the mat. If possible, place the trampoline in a shaded area but beware of tree branches that could be dangerous of they are low enough or if they fall on the trampoline. Invest in a good all-weather trampoline cover so frost doesn’t damage the mat. If possible, place your trampoline in an area where it would be protected from snowfall. Remove the net since the weight from the snow could cause it to collapse. When shopping for a trampoline, look for a product with a rust-resistant frame or with plastic covers that protect the metal frames. If you have a trampoline with exposed springs, invest in protective padding to make your trampoline safer and prevent rust. You can protect the frame from humidity by adding protective tubing and prevent rain from accumulating on the mat thanks to an all-weather cover. Don’t let your trampoline blow away because of high winds! Trampoline tie downs will keep your trampoline anchored to the ground in high winds condition and prevent your children from trying to move the trampoline around. 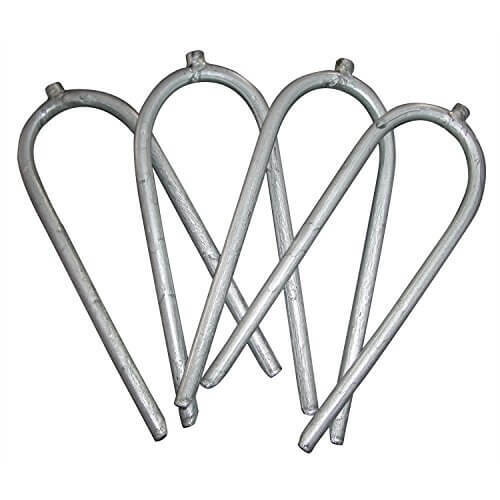 You can also use trampoline pegs to safely anchor the trampoline into the ground or trampoline sakes. These options are more reliable than tie downs but would not be sufficient in a hurricane situation. If there is a hurricane or a severe storm warning, take your trampoline down if you can and store it in your garage. You should at least take the net or enclosure down. If you have to leave your trampoline outside during a storm or hurricane, anchor it as safely as possible with some heavy sandbags. Place a sandbag on each element of the frame but don’t add any weight to the jumping area. Don’t hesitate to combine sandbags with tie downs and pegs for added safety! If you live in an area with heavy snowfall during the winter, you definitely need a good trampoline cover for winter. An all-weather cover would be ideal if you can expect heavy precipitation or simply want protection from sun damage. 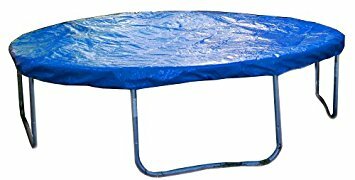 A cover will also protect your trampoline mat from debris falling on it and will help you restrict access to the trampoline when you cannot supervise your children. Make a point of covering your trampoline when your children are not using it. This will expand the lifespan of your trampoline even if you chose a product with a UV-resistant mat. You should also ask your children to always remove their shoes when using the trampoline. This is a simple step that will reduce wear and tear on the mat. Choose a cover that matches the size of the jumping area and that is easy to install and remove. Ideally, your trampoline cover should have some clips or ties so you can safely attach it. Note that the cover will only protect the jumping area. You can find protective padding and tubing for the springs and the frame of your trampoline. You cannot let snow accumulate on your trampoline in the winter. The weight causes a lot of wear and tear on the mat, and cold temperatures can cause serious damages to the mat. You should clear the snow after each snowfall. Stand at the edge of the trampoline and use a broom or a brush to reach towards the center of the trampoline and brush the snow towards you. Using a shovel or another similar tool could damage the mat. If your kids use the trampoline in the winter, try taking the net down overnight since snow accumulating can weaken the enclosure and cause it to tear. If your children won’t be jumping on the trampoline during the colder months, remove the enclosure and store it in your garage. You should also use a trampoline cover for winter to protect the mat from cold and humidity. Using a cover doesn’t mean you can let snow accumulate on the trampoline since the weight would still weaken the springs and the frame. Note that you should also remove leaves from your trampoline in the fall since the weight and humidity can cause damages. Use a broom or a brush instead of a rake. You can make your trampoline last longer by following these maintenance tips. Invest in a few accessories to protect your trampoline all year round, such as trampoline anchors and a good trampoline cover. Think about moving your trampoline to a different location so you can reduce sun exposure or maybe protect the trampoline from precipitations. You should also find out more about the materials of your trampoline. Some products have rust-free or UV-resistant frames while others will require more protection. 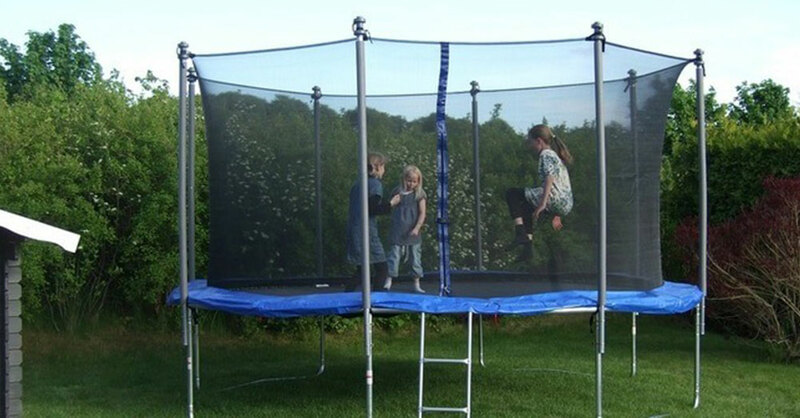 It is best to use a protective cover even if you have a trampoline made from resistant materials. Take a few minutes to go over the manufacturer’s warranty since you will often find some helpful tips to care for your trampoline.